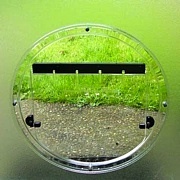 Self lining up to 55mm thick and suited for single & double glazing of glass panels up to 55mm thick. 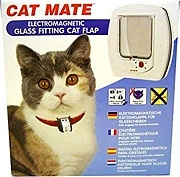 Includes 2 super compact collar magnets worn by your pets and so keeps stray cats out. Easy to use 4 way lock. This door includes a magnetic closing stop to prevent the door from swinging in the wind and features an easy to use 4 way lock. Will fit in most sliding doors. 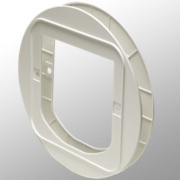 This mounting adapter is for use in windows, glass or metal doors where a large opening needs to be covered. 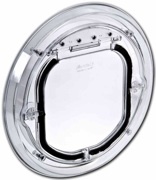 Very popular for the totally clear flap and frame that can hardly be noticed in glass. 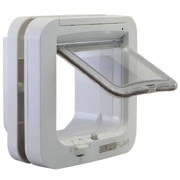 Features a magnetic closing door that prevents it from opening in windy conditions and includes an easy to use 4 x way lock. 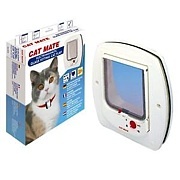 This door can be used as a standard cat door or can be adapted to fit most mounting requirements and fits in most sliding doors.